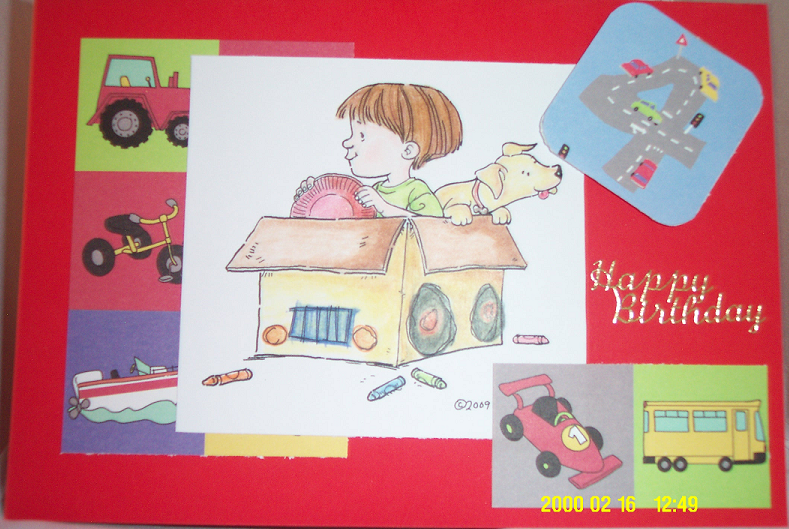 Here is my finished card for my son who will be 4 on Thursday. You'll have to excuse the timestamp in the photograph. I didn't realise it was there until I uploaded the pic and it's not even the right date! So I've used a piece of Red A4 card folded in half. The papers used are from Dovecraft's Kids papers. I won't mention the name of the image as it's part of the candy above but it is from the wonderful Mo Manning. I've coloured it using my Prismacolours which I think I'm starting to get the hang of. The photo doesn't do it justice. Anyway, hope he likes it. I'm sure he'll just toss it aside for the pressies. After all, he's only four! 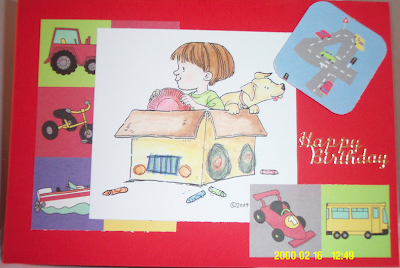 UPDATE: I've just found a challenge to enter for boys cards over at Cute Card Thursday so have entered this card. Pop over and give it a try. That's just like a boy, just want the toys. I'm sure mom will save it for many years, them he will really appreciate it. I try to write a little something in there cards so when they get older they see just how grandma felt about them. You did a wonderful on the card. Really colorful. Mo's images are so awesome. the card is curt and it looks like an a4 card.